This is my first pear pie. I already made two apple pies this fall and I decided that I wanted something for Thanksgiving that felt like apple pie and sort of met that warm comfort food qualification without the apples. I think that this pie fits that bill perfectly! To be honest as much as I love pie crust and double crusts, it’s hard to resist anything with a streusel topping. I think that streusel alone qualifies as dessert. Ice cream … topped with some streusel? Streusel topped with ice-cream? I’m in. This pie also has another element that is a little different than the norm … walnut crust. In the book this is the “Nutty Pie Pastry” on page 42 using only walnuts. Basically the walnuts are ground down to flour using the blender. The walnuts are ground with the sugar, the flour and salt are blended in, and then the fats are added as usual and then enough water for the dough to come together. This is then formed into discs and refrigerated for about 45 minutes to an hour. The extra disc can be frozen for up to 2 months or you can do what I did and just snarf down 1/4 of it cause it tastes so good raw. 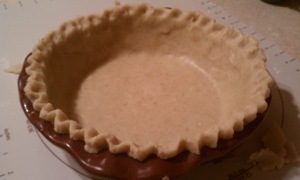 The crust is placed into the pie plate and formed with an upstanding ridge and then placed into the freezer while the rest of the pie is made. The oven is preheated to 400 degrees F.
To the peeled, cored and sliced pears add a mixture of sugar and cornstarch and stir then stir in the rest of the ingredients. 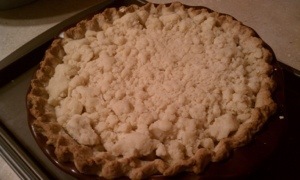 Pour this filling into the chilled pie crust and bake in the center rack of the oven for 35 minutes. While this is baking you can make the streusel topping. Combine flour, sugar and salt in the food processor. 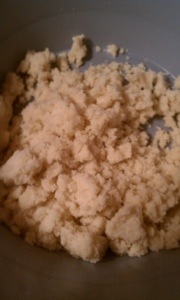 Add butter to the top and pulse until it looks like crumbs. Add milk and pulse again. This should all then be dumped into a large bowl where you can rub the mixture with your hands/fingers to make large crumbs. Refrigerate until ready to use. When the pie comes out of the oven you reduce the temperature to 375 degrees. If the top of the pie is very soupy Ken Haedrich advises adding some quick-cooking rolled oats in the soggy parts to absorb the extra moisture (takes about 5 minutes) so the streusel can stay crisp and not get soggy. Clever idea! Press the streusel down on top of the pie. Return the streusel topped pie to the oven the reverse of the way it came out so it cooks evenly. Bake until the edges are bubbly and thick which should take about 30 – 35 minutes. It’s a good idea to put a pan under the pie to catch any juices that bubble over. Move to a wire rack and let cool. This pie I get to eat! This pie was mind blasting. This is my current favorite pie. My wife said that this was the best pie I’ve ever made and I have to agree. No part of this pie is “filler”. The crust is nutty and full of flavor. The topping is streusel, so crunchy, so buttery… forget about it. The inside was what was most surprising. Reminiscent of apple pie but with its own flavors and even textures. I love this pie. It takes a little longer as you have 3 parts that each take a little while. Spend the extra time. Life’s too short to waste it not making great pies. 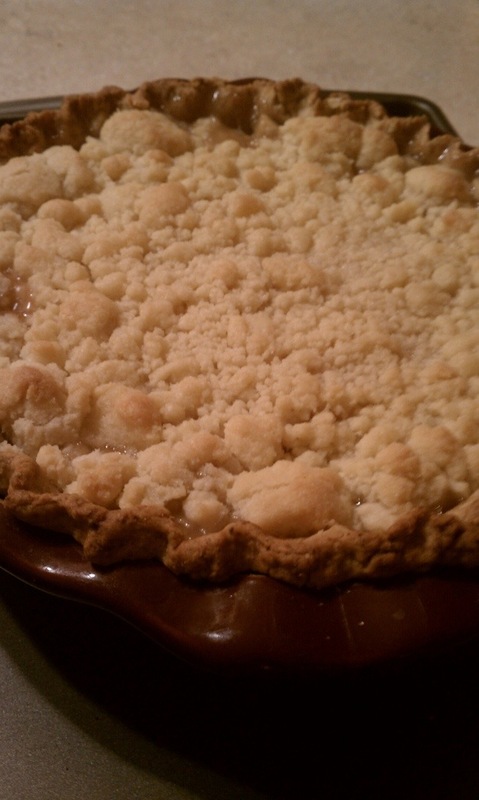 This entry was posted in Baking, Foodery, Fruit Pies, Pear, Pie and tagged crust, Ken Haedrich, pear, Pie, streusel, thanksgiving, walnut crust. Bookmark the permalink.